Can a single quilt save the world? One colorful homemade quilt, hand-carried eight years ago by Sisters Country resident Janet Storton to a Ugandan village where women are a marginalized group, has inspired threads of real socioeconomic change. And through the nonprofit Storton launched, Sisters of the Heart Foundation (SOH), those threads continue to be artfully arranged into a vibrant banner of hope for Africa and beyond. Storton will be sharing the stories of the women behind SOH and selling their unique African-made textile products at Sisters Coffee Company throughout the Sisters Outdoor Quilt Show this Saturday, July 13. In 2007, after retiring from 20 years as a local interior designer, Storton was invited to accompany a church-sponsored medical team traveling to Kapchorwa, Uganda. She was skeptical that she had any skills to offer but anxious to meet the child she and her husband, Peter, had been sponsoring. She delivered a quilt to the child's family, as a gift. "A woman saw it," she remembers, "and cried, 'Oh, please come back and teach us!'" Storton has since journeyed to Africa 14 times. Three times, Storton has worked in a non-governmental vocational school in northern Uganda, teaching practical skills to the kids termed the Invisible Children, who escaped or have been rescued out of LRA rebel camps. Now teenagers, her students were once forced into a life of violence as child soldiers. The purpose of her most recent trip was two-fold. First, she accepted an invitation by the Peace Corps to teach women in Masindi, Africa to quilt so they have a product to market to tourists passing through. Second, she revisited Kapchorwa to oversee the purchase by SOH of a plot of land overlooking a lush valley. The property transaction quietly made history. SOH, a foundation run by women for women, owns title. "It's a first for women in Kapchorwa," says Storton. They plan to start building a guesthouse on the land by next spring. Thanks in part to the ongoing involvement over the past decade of Sisters-area churches and residents - sending medical teams, digging a well, building a school, sponsoring hundreds of village children, founding a wholesale coffee company (Kabum Coffee) - Kapchorwa is improved, with less disease, and attractive to groups needing a place to stay. Storton foresees medical teams, research teams, coffee buyers and others descending upon the SOH-run guesthouse. "It will be a lovely home one day. A nice, cozy, sanitary guesthouse with a kitchen." Remarkably, the 2012 Summer Olympics in London stirred an additional and unforeseen boon to the area when Stephen Kiprotich, who hails from Kapchorwa District, brought home the first-ever gold medal for Uganda in the marathon. Kiprotich is currently building his home on the property adjacent to the SOH property. Kapchorwa is now beginning to host an influx of Olympic-level athletes, trainers, coaches, and corporate athletic sponsors, attracted by its altitude, lower-than-average incidence of mosquitoes and diseases, and improved health conditions. In considering the current vibrancy of the area, it's hard not to draw a direct thread to the support of a small community a world away - the town of Sisters, Oregon. Conditions in Kapchorwa have clearly changed on many levels, says Storton. "I'm seeing a new sense of pride with women in the area. God is shining down on this community, opening doors." At the heart of Storton's work is the now-five-year-old SOH training program run by four female directors in Kapchorwa, which offers women a six- to eight-week program training them in basic practical skills: sewing, quilting, cooking, baking and hygiene. The sales of their textile products funded the recent land purchase and supports the economic welfare of those in their own community. "I've had people call from all over the world, so excited at the uniqueness of having a quilt from Africa," says Storton. "They [the directors of SOH] have little," she says. "But if they have a roof plus a small garden plot, they don't see themselves as the needy ones. From day one, they asked, 'Could we help others who are needier then we are?'" The foundation continually identifies other women in the village who have the very least, offering micro-gifts to widows, women with disabilities or many children to feed. Storton plans to return to Kapchorwa in October to hire a contractor and set a budget for the guesthouse building project. She hopes to leverage the willing hands of church mission groups to help defer some construction costs. "The ladies [of SOH] are excited. They are eager to manage the guesthouse. It will be a real sustainable project for them." Kapchorwan women artisans created all of the blocks for this year's raffle quilt, and Storton will be selling raffle tickets outside Sisters Coffee Company during Quilt Show for $1 each or 6 for $5. Also for sale are the popular quilts and table runners, as well as some new items: fabric-bead necklaces and decorative mobiles. "The proceeds will help get our guesthouse built," says Janet. Storton is content to stay involved as long as the door is open to her. "This is what I was trained to do, what I was meant to do. 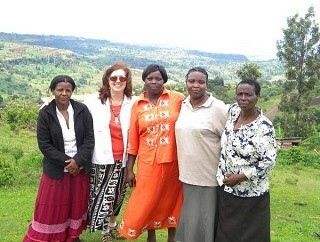 Every time I am with these women I feel God is working here! He is making their dreams come true." For more information, visit www.sistersoftheheartfoundation.org or email Janet Storton at jstorton@bendbroadband.com. I am so overwhelmed reading this. thank you so much for empowering these women and many other projects on the African continent. May you not lack anything good in your life. This comment has been hidden due to low approval.